Women must take a stand against mandatory vaccines because it is a clear violation of their bodies. Mike Adams urges women to unite and stand against mandatory vaccines. 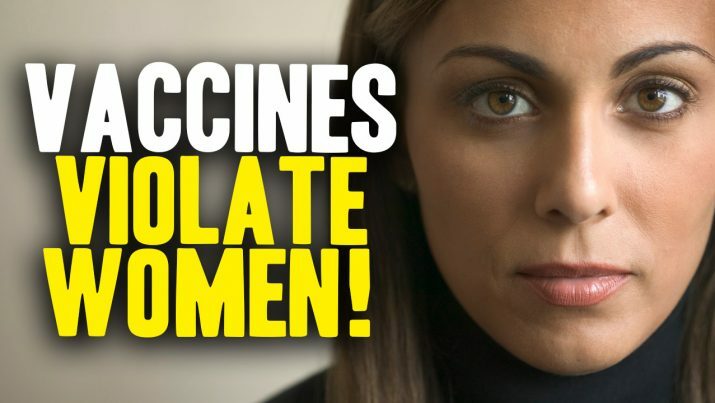 The government, which is clearly influenced by the big pharma industry, forces women to be vaccinated. In doing so, they penetrate, contaminate, harm, and invade women’s bodies with viral strains, toxic heavy metals, and deadly chemicals that cause severe damage. A woman’s body is her domain. No one can tell her what to do (or not to do) with her body. All women agree that “no means no”; but this is the case when “no means yes.” And women can’t do anything about it. The government wants women to believe that it is in their best interest to inject them with harmful toxins, soothing fears by saying that this is actually beneficial. However, the vaccines being introduced into the body are highly dangerous. The government has granted the pharma industry blanket immunity from any lawsuits filed against them. That means they cannot be held criminally liable in case these vaccines cause permanent damage. Vaccines contain toxic chemicals such as mercury, aluminum, monosodium glutamate (MSG), and formaldehyde. In some cases, vaccine companies are actually injecting people with a disease, as some of the vaccines they administer are not fully attenuated. Some of them are live viruses. Throughout history, women have fought for their basic human rights and won. Yet even to this day, women’s bodies are not perceived as their own in terms of medical interventions. For example, pregnant women are forced to take vaccines for the benefit of their unborn child. These vaccines contain toxic chemicals such as mercury. Mercury damages the developing brain of the child. It’s a direct violation of the fundamental human right for safety. The government is the enemy of the human body as it forces people to undergo vaccination against their will. Paired with the huge pharma industry, they believe they own every person and see them as slaves. A country whose government controls them is not free. People under this government are slaves to the “medical tyranny” of the system willing to destroy lives just to serve the interest of the corrupt vaccine industry. Vaccination is in the best interest of the government and not to its people. Women, as well as men, should have a say on this matter. They must say no to any interventions that violate the body. That said, the Health Ranger firmly believes the government must be radically reformed to respect the human’s fundamental rights. The Health Ranger is a scientific humanitarian who was awarded a U.S. patent for his breakthrough invention known as “Cesium Eliminator”. This formula eliminates the toxic cesium-137 radionuclides from the human body. The Health Ranger has offered the manufacturing and licensing rights of his invention to any government that needs to protect its citizen against any threat coming from a nuclear attack. Known in real life as Mike Adams, he also heads an analytical laboratory that is ISO-accredited. The products tested in this laboratory are sold in the Health Ranger’s online store. Adams is also the author of the number one bestselling science book on Amazon.com, “Food Forensics”. Because of his crusade to expose the dangers of vaccines and the corruption of the big pharma industry, the Health Ranger has become the target of powerful corporations that seek to silence him.